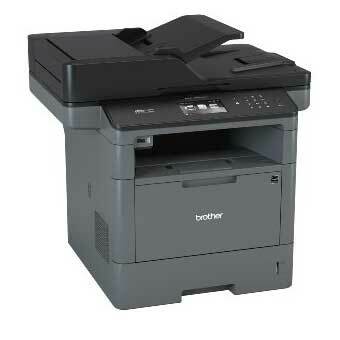 Brother MFC-L5900DW printer Brother ini memiliki kecepatan cetak hingga 40 ppm (print per minute). Seri ini juga memiliki fitur andalan seprti Automatic Document Feeder (ADF) dengan kapasitas maksimal 70 kertas dan sistem Dual Scanning (Dual CIS) hingga 100 ipm (image per minute). Improve efficiency and convenience with the Automatic Document Feeder (ADF). Enabling unattended scanning, copying and faxing of multi-page documents quickly and easily, complementing our MFC’s stack and sort capabilities. Featuring high print speed of 40ppm, users can save time when performing large volume printing tasks. They can utilise their time more efficiently instead of waiting for their printouts. The direct print feature enables users to print files such as PDF, JPEG, TIFF or printer-ready documents without even using your computer! Print directly from a USB flash memory drive by simply connecting them to our printers. Multi function Centre with Print, scan, copy and fax. Fast print speed of 40ppm, Full Automatic 2-sided Monochrome laser with Ethernet Gigabit Ethernet and Wireless connectivity and USB direct Printing.